Australia were on the verge of squaring the Test series against India despite another valiant batting effort from Rahul Dravid at the end of the penultimate day’s play of the third cricket Test here today. Pakistan were just 28 runs away from victory against New Zealand after Shoaib Akhtar ripped through the host’s batting taking six wickets on the fourth day of the second Test today. Ramnaresh Sarwan and Shivnarine Chanderpaul scored courageous centuries in vain as South Africa won the second Test against the West Indies on Monday. Vijay Dahiya scored a patient 93 but Delhi failed to obtain any points as their four-day Ranji Trophy Elite Group-A match against Andhra ended in a draw here today. India's Parthiv Patel avoids a bouncer from Australia's Brad Williams during the fourth day of the third Test at Melbourne on Monday. The final of the Kenstar Asian A Teams’ Tournament tomorrow looks to be a close affair with both India and Sri Lanka having the right kind of ammunition, though the hosts with three straight wins will hold a psychologial edge. Despite Churchill being reduced to 10 men midway into the second half, Salgaocar failed to cash on the advantage as they rallied from behind to hold their rivals to a 2-2 draw in the 8th National Football League here today. The top eight junior players in the 14 to 18 years age group (both boys and girls) will compete in the All-India Tennis Association (AITA) Masters Tournament to be held at the Delhi Lawn Tennis Association courts from December 30 to January 3. This is an invitation event for the best eight ranked players on the AITA Ranking List. Probables for the Junior National Volleyball Championships being held in West Bengal in January have been announced. Mr M.S. Bhullar, president, Punjab Volleyball Association, announced the names after the completion of the state championships at Mastuana Sahib. The third day of the 44th Senior National Gymnastics championship being played at the Shivalik Public School, Mohali saw favourites Uttar Pradesh clinching the men’s artistic team championship. Led by star international gymnasts Vikas Pandey, Mohit Yadav and Mayank Srivastava, UP men stole the limelight by gaining 245.45 points. Indian Oversees Bank, Chennai, and Punjab Police notched up impressive wins in their respective semifinal matches to set up the summit clash in the 28th All-India Liberals Hockey Tournament at the Ripudaman college ground here today. The following players have been selected to represent Punjab in the forthcoming 18th Federation Cup scheduled to be held from January 2 to 6 at Chennai, according to Mr S S Channy, president, Punjab Handball Association. Panjaura won the 23rd Punjab Rural Soccer Tournament beating Mazara Dingrian 4-0 in the final at Nangal Khilarian, near Hoshiarpur on Sunday. Indian captain Sourav Ganguly (R) has a trainer check his condition after he was struck in the head by Australian pacer Brad Williams, forcing Ganguly to retire hurt on the fourth day of the third Test at MCG. Sachin Tendulkar finally made some runs before succumbing again outside the off-stump for 44 and Saurav Ganguly scored a gritty 73 to back up Dravid’s patient 92, but this effort may not be enough to save India which made 286, leaving Australia to score 95 runs for victory on the final day. The target should not pose much of a problem for the formidable Australian batting line up determined to make amends for the Adelaide debacle. 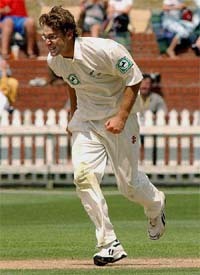 Brad Williams was the pick of the Australian bowlers with four for 53 while the others, Brett Lee, Nathan Bracken, and Stuart MacGill grabbed two wickets each. India were once again undone by a late order collapse that doomed them in the first innings. The tourists, 253 for four at one stage, lost their last five wickets for 33 runs. If Dravid played a rare loose shot, poking at a wide delivery with bat away from the body, Ganguly might have got carried away by his success when he played on. The shot that got the Indian captain to Bracken was not questionable but the left hander seemed to have made his mind to go after the bowlers with the second new ball and make as many runs as possible while he was at the crease. 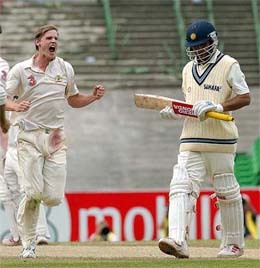 Ganguly was particularly severe on Lee as he clobbered him for two scorching fours twice in successive overs. But when he fell, the flaws of his tactics were exposed. For, India needed to bat out the day, and given the matured way in which Patel tried to marshall the tail towards the end, the team would have been in a far better position with fewer runs had Ganguly been batting at stumps. As it were, India would now be looking up for divine interruption on the morrow. The weather men have forecast showers in the afternoon, but the target might be a little too small to deny Waugh’s men a deserving victory. The Aussies, at the receiving end after their shock loss at Adelaide, stuck to their game plan of bowling outside the off-stump and cutting out on the range of Indians’ strokes. This in itself was a remarkable improvement for the Australian bowlers who had looked ordinary in the previous Tests but the same bowlers came together well here. FoW: 1-5, 2-19, 126, 4-164, 5-253, 6-258, 7-271, 8-271, 9-277. Bowling: Brett Lee 22-3-97-2, Nathan Bracken 25-13-45-2, Brad Williams 22-5-53-4, Stuart MacGill 26.5-5-68-2, S Katich 4-0-16-0. Pakistan ended the day on 246 for three after captain Inzamam-ul-Haq spurned the additional eight overs on offer to claim the victory much to the surprise of the New Zealand players. The tourists must now rely on the weather to stay fine to complete the task tomorrow. Inzamam was on 57 and Yousuf Youhana on 73, having virtually settled matters with a 90-run unbeaten partnership. New Zealand resumed the day on 75 for three and got to 95 before losing Mark Richardson (41) and then the avalanche of wickets came with the final seven falling for just eight runs. Shoaib made light work of the New Zealand order in the morning session as the home side collapsed to be all out for 103 in their second innings. The pace bowler took six for 30 to finish the match with 11-78. Imran Farhat was the first Pakistan batsman out, for 14, when he attacked a Jacob Oram bouncer down the leg side and gloved the ball to Robbie Hart behind the stumps. Fellow opener Taufeeq Umar went for 34 when he went back to a sharply-spinning Daniel Vettori ball and was trapped in front. The other Pakistan wicket was that of the impressive Yasir Hameed, who got an edge to an Ian Butler delivery and was caught by Hart for 59. Fall of wickets: 1-8, 2-43, 3-73, 4-95, 5-95, 6-96, 7-101, 8-102, 9-103. Bowling: Akhtar 18-3-30-6, Shabbir Ahmed 17-5-20-2, Sami 4-1-12-0, Kaneria 9-2-18-1, Razzaq 5-1-19-0. Fall of wickets: 1-37, 2-75, 3-156. WELLINGTON: New Zealand’s most capped one-day cricketer, Chris Harris, missed selection on Monday in the team to play Pakistan in five limited-overs internationals in January. Harris, 34, has scored 4,250 runs and taken 199 wickets in his one-day career for New Zealand beginning with the 1990-91 World Series in Australia. He toured Pakistan with New Zealand in November but played in only two of five internationals and has struggled for form in domestic play. Test opener Lou Vincent was also omitted from the 13-man squad named by new New Zealand coach John Bracewell on Monday. Sarwan scored 114 and Chanderpaul made 109, but South Africa dismissed the West Indies for 329 to win by an innings and 65 runs with a day to spare to take an unassailable 2-0 lead in the four-match series. 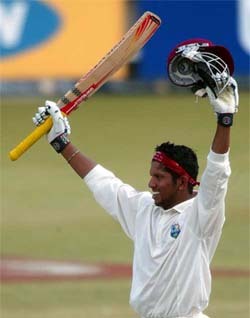 The West Indies were dismissed for 264 in their first innings to which South Africa replied with 658 for nine declared. Ntini took three for 72 to end 2003 with 59 wickets and to become the bowler who has taken the most Test wickets in the world this year. Replying to Andhra’s first innings total of 438, Dahiya showed a fine temparament to occupy the crease for 235 minutes while Varun Kumar produced a more belligerent 75 as Delhi reached 386 for seven before play was called off after the sixth mandatory over due to bad light. Both the teams failed to garner any points from the match since the first innings could not be completed, thus completing their league engagements with six points each. Resuming at the overnight score of 155 for one, Dahiya and Pururaj Singh (47) put on 127 runs for the second wicket to keep Delhi on course for the first innings but a few quick wickets after their dismissals allowed the hosts to wrest the initiative. Dahiya faced 183 balls and struck one six and ten boundaries during his knock of 93 while Pururaj Singh was much more sedate occupying the crease for 360 minutes for his 247-ball 47 which was studded with five boundaries. Star batsman Ajay Jadeja was dismissed cheaply for 18 and Rajan Gupta (8) also returned to the pavilion quickly to throw the Delhi innings in disarray. Going into the final India A have 18 points compared to Sri Lanka A’s 11. Pakistan A, the third team in the tournament with seven points, are already out. Sri Lanka A skipper Russel Arnold has been very straight forward in his approach. After losing a close match to Pakistan A in their second meeting in the tournament, he made it clear that he was disappointed that the team had to look at a bonus to be in the final. “My team has the talent and the capability to win. But we have done a few things wrong on the ground. We have played some callous shots and given too many loose deliveries,” he added. Indeed the Lankan top order has the potential to challenge any total. They did the unthinkable of overhauling the target of 300 in two consecutive games, once each against India A and Pakistan A. This is a record of sorts in Eden Gardens as not too many times has this happened. The top order of S Kalavitigoda, Jayawardane, J Mubarrak, N Nuwaz and Arnold are all capable batters. Mubarrak and Jayawardane have shown their prowess to hit the big shots and accelerate in the slog overs. Arnold has shown some rosy form scoring 196 runs without being out in the first two games of the tournament, before he struck the bedrock. In the next two matches he scored a meagre 18 runs and is in for some runs in the final. With both the teams trying to gauge each other’s strength, Salgaocar took the lead in the 14th minute when a move from the left saw Felix Ibrebru getting the better of defender Hussian and sent a waist high cross to Freddy Mascarenhas who controlled the ball before despatching it into the net from close. Churchill retaliated and equalised the next minute when Yakubu relayed to Ratan Singh on the right and the latter send a cross to John Kingsley who nodded home. Thereafter, play was confined to the midfield. One minute before the interval, Churchill took the lead when Yakubu, after getting the ball on the left, got the better of rival defender and sent a goalmouth cross for Roque Pereira who left-footed the ball in. Salgaocar played with more zeal in the second half and restored parity in the 51st minute. A counter move on the right saw Ragi Singh shot blocked by defender Osumanu Husseini and the deflection came to Jatin Bist who sent a stiff grounder that found the net. Churchill were reduced to 10 men in 62nd minute when John Kingley got his second yellow card from referee Walter Pereira. Salgaocar, who had ball possesion and midfield superiority, lacked the creativeness to punch holes in the rival defence and the absence of Tomba Singh and Dharamjit Singh was felt. On the contrary Churchill played an attacking game and nearly came to take the lead but Yakubu was late in connecting a cross from the right. Every player, regardless of his performances in the previous year, starts with zero point at the beginning of the year. The best points from the AITA series and ITF series will be considered for the Masters. Tushar Liberhan and Sanak K. Singh of Chandigarh figure in the under-18 boys section while Kinshuk Sharma is the lone representative from Chandigarh in the boys under-14 event. No player from Chandigarh figures in the girls under-18 and girls under-14 events. Boys: Jagjit Singh, Nitish, Gagandeep, Major Singh, Manvir Singh, Amrit Pal Singh, Dinesh Sharma, Sanju, Gurpreet Singh (Sangrur) Gurpreet Singh, Manjit Singh, Mandeep Singh (Jalandhar), Suraj (Muktsar), Sukhjit Singh (Bathinda), Jaswant Singh (Ropar), Dharminder Singh (LDH), Mandeep Singh (PTA), Jaspal Singh (Amritsar). Girls: Suman, Daljinder Kaur, Mandeep (ASR), Sandeep, Niti Sharma, Charanjit Kaur (LDH), Neha (Gurdaspur), Renuka (HSP), Manpreet Kaur, Baljinder (Bathinda), Sunita Sharma (PTA), Karandeep (Sangrur). Standby: Kiranjit Kaur (LDH), Richi Rani, Arshdeep (Jal), Tajinder Kaur (Ropar). The third day of the 44th Senior National Gymnastics championship being played at the Shivalik Public School, Mohali saw favourites Uttar Pradesh clinching the men’s artistic team championship. Led by star international gymnasts Vikas Pandey, Mohit Yadav and Mayank Srivastava, UP men stole the limelight by gaining 245.45 points. Services secured the second place with M. Shinoj and Raja Roy spearheading the campaign. Railways led by Sudip Jana and Prashanjit secured the third place. Earlier in the morning the rythmic gymnastics event were also held. The top ranked female gymnasts Rajni Sharma of Punjab, Dimple, Amrita Hazarika also flexed their muscles in various events. In the team championship, Vikas Pandey scored 52.10 points which included 8.80 points in floor, 8.75 points in pomelled horse, 9 points in Roman rings, 8.35 points in vaulting horse, 8.70 points in parallel bar and 8.30 points in horizontal bar. His score was closely followed by Mayank Srivastava who recently won silver medal in the Asian gymnastics meet held in Korea last month. Mayank secured 52.05 points, including 8.75 points in floor, 8.80 points in pomelled horse, 8.30 points in roman rings, 9.30 points in vaulting horse, 8.80 points in parallel bar and 8.10 points in horizontal bar. The points scored by other gymansts of UP were: Mohit Yadav-50.10 points, Uday Bhaskar Singh-32.70 points, Deepesh Sahu-40.95 points, Abhishek Dixit-38.45 points and Vivek Mishra-24.45 points. Services men who got the second position by collecting 245.30 points were, M. Shimej-49.80 pts, Raja Roy-49.40 pts, R.K. Vijay Singh-31.85 pts, Ramesh 47.75pts, NGA Singh-45.95 pts, Zia-ur-Rehman-33.85 pts and Sandeep 32.05 pts. The third place was secured by Railways. The team comprised Sudip Jana, Prasanjit, Sarafraj Ahmed, Kedar, Gaurav, Sharath and Sonveer. Meanwhile Vikas Pandey of UP with 53.20 points was adjudged the all round Individual champion, Mayank Srivastava of UP was second with 52.05 points, while B.N. Shiva Kumar of UP was placed at third with 50.50 points. Saraf Ahmed of Railways finished fourth with 49.85 points, Karan Bahadur of Chandigarh secured the fifth place with 48.75 points and Manoj Behra of West Bengal claimed the sixth spot with 48.65 points. While debutants IOB demolished four times champions BSF, Jalandhar, 4-1, Punjab Police started slowly but picked up pace in the second half to vanquish Vajra Corps 2-0. IOB played to a plan with attack being their first priority while their opponents looked pedestrian. In fact what stood out in IOB’s display was not just the planning but also the purpose they showed, particularly in the second half when they virtually walked away with the match by scoring as many as four goals. After a goal-less first half, the game opened up and center forward K. Senthil set the tone for the Chennai team with an astute pass to right out S. Anandan who was camping in the danger area. The IOB right-out, after controlling the awkward bounce on the ball, let go a stinging drive which sounded the board to signal his team's first goal. Minutes later, BSF were in for another shock when D. Felix managed to latch on to a long pass from the left, and after working his way in the striking area, he slipped the ball between the custodian’s pads. With a two goal deficit staring them in the face, the Jalandhar security men’s response was sharp and they managed to reduce the margin through Christopher Ekka. However, BSF’s joy quickly evaporated when K. Senthil was dangerously felled in the area and the resultant stroke was converted by S. Anandan. The match was put out of reach by defender K. Sasikaran when he scored off a penalty corner to enable IOB romp home with a 4-1 margin. Punjab Police managed to hoist the lead, much against the run of play, when Sukhwinder fired in a shot from top of the circle. Minutes later centre half Kuljit Singh sealed Vajra Corps fate when he swept the ball past the goal tender, once it rebounded of his chest to make it 2-0. The players are:- Raghu Kumar, Karamjit Singh, Mukesh Kumar, Kulwinder Singh, Sukhdev Singh, Rajesh Thakur, Pawan Kumar, Naveen Kumar, Sachin Kumar, Gaurav Sehgal, Baljeet Singh, Jaswant Singh, Lachhman Singh, Nirpinder Paul Singh, Sunny Sangar and Palwinder Singh. Mr Kewal Singh and Mr Gursewak Singh will accompany the team as coaches. In the semifinals Panjaura had defeated Chak Mallan 7-6 while Mazara Dingrian edged out Kaindhowal 2-1 through the golden goal. Gurvinder Singh Soma of Chak Mallan was declared the best footballer . Punjab Assembly Speaker Dr Kewal Krishan distributed the prizes and announced a grant of Rs 1 lakh for the promotion of sports in the area.